Designed for lighting, audio and data installers and systems integrators, our series of products are the lowest cost accessory receptacle plates, modules and adaptor plates available! Competitive products are expensive, 'over designed' aesthetically (making them unnecessarily expensive for such a basic item) and some are very time consuming and tedious for the installer. Most dealers have become frustrated at the escalating costs of these basic accessories and the time to install them contributes to a project - a new installation or as part of a repair/upgrade project. Our receptacle plates, modules and adaptor plate products are designed to be inexpensive, durable, quick to install yet 'technician friendly' and, most importantly, to do the job! Unique "dual position" breakaway style connector permits choice of side or rear wire entry. RP-1x1-? 1 Gang - 3.000" x 4.875"
MDSP: $49.00 RP-1x2-? 1 Gang - 3.000" x 4.875"
RP-2x2-? 2 Gang - 4.8125" x 4.875"
MDSP: $86.00 RP-2x4-? 2 Gang - 4.8125" x 4.875"
RP-3x3-? 3 Gang - 6.625" x 4.875"
MDSP: $125.00 RP-4x4-? 4 Gang - 8.4375" x 4.875"
RP-5x5-? 5 Gang - 10.250" x 4.875"
MDSP: $204.00 RP-6x6-? 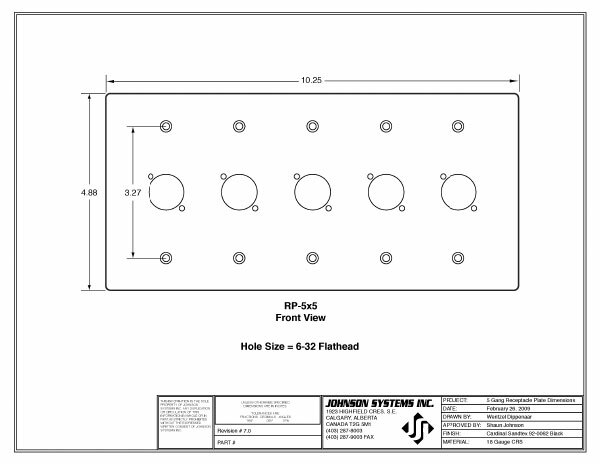 6 Gang - 12.0535" x 4.875"
Select a Receptacle Plate to submit an order. 6-pin modules are not available in Neutrik "B" Series. As the line expands, we will update selection. Click here to download JSI's receptacle series dimensional drawings for contract documentation. ZIP file contains ten (10) PDF files for all receptacle series plates.